Audi of America is committed to achieving approximately 30 percent of U.S. sales from electric vehicles by 2025. Audi debuted its first all-electric vehicle – the e-tron – on Sept. 17, 2018. One in every three Audi vehicles sold in the U.S. will be electric by 2025. Audi will introduce two more electric vehicles by 2020, the e-tron Sportback and the e-tron GT. With progressive design and the performance customers expect from Audi, e-tron drivers will go electric without compromise. 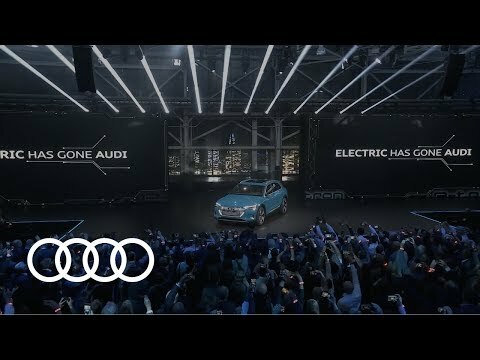 On Monday, Sept. 17, in San Francisco, Audi unveiled the fully electric Audi e-tron, a five-passenger SUV aimed at the heart of the premium market. Intel performed its first-ever combined indoor and outdoor Intel drone light show in collaboration with Audi for the world debut of its all-electric SUV—the Audi e-tron. European model shown. Specifications may vary.